Spatial heterogeneity can have dramatic effects on the biochemical networks that drive cell regulation and decision-making. For this reason, a number of methods have been developed to model spatial heterogeneity and incorporated into widely used modeling platforms. Unfortunately, the standard approaches for specifying and simulating chemical reaction networks become untenable when dealing with multistate, multicomponent systems that are characterized by combinatorial complexity. To address this issue, we developed MCell-R, a framework that extends the particle-based spatial Monte Carlo simulator, MCell, with the rule-based model specification and simulation capabilities provided by BioNetGen and NFsim. The BioNetGen syntax enables the specification of biomolecules as structured objects whose components can have different internal states that represent such features as covalent modification and conformation and which can bind components of other molecules to form molecular complexes. 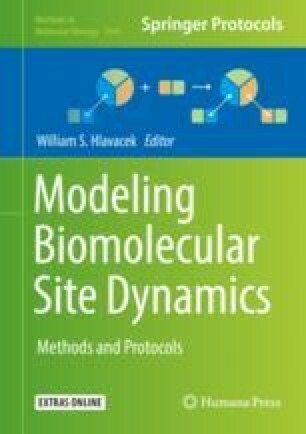 The network-free simulation algorithm used by NFsim enables efficient simulation of rule-based models even when the size of the network implied by the biochemical rules is too large to enumerate explicitly, which frequently occurs in detailed models of biochemical signaling. The result is a framework that can efficiently simulate systems characterized by combinatorial complexity at the level of spatially resolved individual molecules over biologically relevant time and length scales. This work was supported in part by the US National Institutes of Health grants P41GM103712 and R01GM115805.